Biological oceanography is the study of life histories of marine organisms, their relationships to one another, how they interact with and adapt to their environment, and the processes that govern their distribution in the ocean. Work in this field is interdisciplinary, as the relationships studied can be complex and the physics, chemistry, and geology of the ocean have important effects on organisms. Therefore, studies in biological oceanography often involve aspects of physical oceanography, marine chemistry, and marine geology. Biological oceanographers may study a wide variety of topics including marine microbiology, parasitology, marine toxicology, food chain dynamics, nutrient cycling, benthic population and community ecology, phytoplankton ecology and physiology, zooplankton ecology and physiology, coral reef ecology, marine invertebrate biology, fisheries science and management, marine invasive species ecology and marine mammal science. Research is conducted on space/time scales ranging from short-term interactions between individual organisms to long-term associations of widely dispersed populations and their environment. Graduate degree in marine biology or biological oceanography often needed for advancement. Depending on the position, biological oceanographers may spend considerable time in the field gathering data. Fieldwork can require travel to remote locations all over the world. To explore and define the roles of organisms in the marine environment, biological oceanographers may use a variety of research tools and techniques. These may include shipboard sampling, computer modeling, high-resolution video analysis, bio-optics, and/or acoustics. For example, archival marine acoustic recording units (ARUs) , such as the Ecological Acoustic Recorder (EAR), are used to monitor the ambient sound field of coral reefs and other tropical systems. Biological oceanographers may also use acoustics to study plankton. Plankton are relatively small organisms whose movements are dominated by currents, though many can swim. Sonar systems, similar to fish finding sonars , can be used to study plankton and fish abundance and distribution. Marine fishes and mammals produce underwater sounds and scientists can listen for these sounds, using tools such as hydrophones, hydrophone arrays, and other passive acoustics sensors, and detect different marine animal species. acoustic gliders are a type of ocean glider that includes a hydrophone, can work continuously in all weather conditions for long time periods, possess a suite of high-resolution oceanographic sensors, and operate silently (because they do not have an engine or propeller). 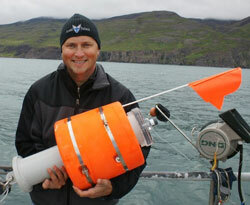 Researchers use acoustic gliders to study whale distribution, behavior, and habitat. Acoustic gliders have been used to study Sei whales , North Atlantic Right whales, and Beaked whales. They have also been used to track acoustically tagged fish. Estimating abundance (population size), animal density (number of animals per unit area), and the overall distribution of marine animals is critical to understanding marine ecology as well as making important and effective management and conservation decisions. Marc Lammers holding an Ecological Acoustic Recorder (EAR). Marc Lammers is an Associate Researcher at the Hawaii Institute of Marine Biology and the President of Oceanwide Science Institute, a Hawaii-based non-profit organization involved in marine research and conservation globally. He is also on the Graduate Faculty of the University of Hawaii’s Biology Department and the Marine Biology Graduate Program, where he teaches and advises graduate students. His research interests are varied, but are primarily focused on marine bioacoustics and cetacean behavior. Dr. Lammers earned his PhD from the Department of Zoology at UH studying the acoustic behavior of dolphins and worked as a post-doc with NOAA’s Coral Reef Ecosystem Division in Honolulu where he led the development of the Ecological Acoustic Recorder (EAR). His work to date has yielded numerous scientific publications and he actively collaborates with researchers around the world. His interests in marine science are broad and range in scope from research to education and conservation. He has worked on projects focused on a variety of topics and marine organisms including corals, fish, turtles, dolphins and whales. Sounds in the Sea > How do marine animals use sound? Investigate Marine Animals > How us sound used to study the distribution of marine fishes?